In 1917, Tsarist Russia was strife with political agitation. Despite the fact that communists were most active on the front, it was only after the arrival of Lenin, thanks to a special operation by the Germans, that the revolt spread. In October, an uprising in St Petersburg led to the overthrowing of the Tsar, and the rise, before the amazed and ashamed eyes of western nations, of the first communist regime ever. At the end of the First World War, a new conflict was already emerging in Russia, the Civil War of 1919-1921. Despite some successes, White Russians (supported by Western Powers) were ultimately crushed by the Bolsheviks. A new regime, more radical, was now held in place by Lenin. After his death in January 1924, Stalin took his place and, after years of forced agrarian reforms, tried in the 1930s to raise the USSR to the level of the western industries. He ultimately succeeded, with brutal efficiency, while also turning the country into a police state and military camp in the process. Success was visible each year in the Red Square, showing new tank models, with most of the development inspired by western technology. “Russky Reno”, the first Soviet tank. In 1939, the USSR had the biggest armored force in the world, numerically superior to all western powers combined. Before 1936, the Red Army displayed brilliant and innovative armored tactics, well trained crews and experienced officers. But, starting in 1936, Stalin ordered a series of “great purges”, out of fear of a military coup. Almost three quarters of the most capable officers of all ranks were wiped out or exiled in Siberian camps, as well as engineers. As a consequence, all remaining officers were rather inexperienced, not formed properly or too scared for fear of reprisals, blindly following orders to the letter, never taking any personal initiative until official approval by Moscow. New officers were also always chosen on loyalty over skill. In the summer 1941, this lack of flexibility and experience proved fatal to the Red Army. Operation Barbarossa, at first a clear success for the Wehrmacht with dire consequences for the Red Army, it turned into a nightmare for the Germans, due to the Russian climate and lack of roads. The last miles to Moscow proved out of reach. December and January 1942 saw a Red Army massive scale counter-attack, the first of this campaign. The desperate and costly struggle at Rzhev pinned down German forces, allowing the victory at Stalingrad in January 1943. After the battle of Kursk in the summer, military initiative gradually shifted into the hands of the Stavka (Soviet High Command), although the Germans still enjoyed successes on various front and in several battles (such as at Kharkov). The tanks played a vital part. 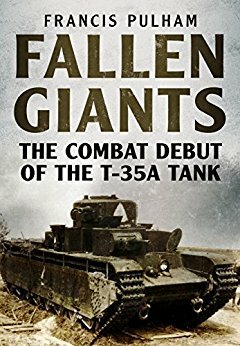 Until the fall of 1941, Wehrmacht crews only encountered swarms of lightly armored tanks. But they also stumbled upon small numbers of heavy KV-1s and medium T-34s, finding in horror that the German shells simply bounced off them, as the tanks’ protection was thick and well-sloped. Another landmark in this incredible story is the fast relocation of all heavy war industries beyond the Ural range, in an unprecedented and ruthless way, followed by a complete production reorganization around a few tank types. By mid-1942, the sheer weight of “Tankograd” began to talk. By 1943, the scale of the T-34 production outpaced by far anything the Germans could do. This allowed the Red Army to overrun any German resistance for the last two years. In 1945, after Germany surrendered, they threw all this might against the Japanese forces in Manchuria, which was largely under-equipped. The immense confidence born inside the Red Army in these years ultimately led to the Cold War. The “Russky Reno” was the very first Russian tank, a copy of a White Russian Renault FT captured in 1918. It was completely disassembled, studied and reproduced by workers of the factory “Red Sormovo” in 1920. It took the name “Comrade Lenin, The Freedom Fighter”. But the lack of manpower, resources, largely obsolete tooling and devastated infrastructure resulting from four years of relentless civil war delayed the introduction of the first proper Russian tank by six years. This first vehicle was the T-18, derived from prototypes based on the FT. Its official designation was Maliy Soprovozhdeniya, Perviy (Small Support Vehicle Number 1), which is why it was also known as MS-1. It was produced from 1928 to 1931, armed with a 37 mm (1.46 in) and a machine-gun. 960 were built, used later for training. They saw little action before being phased out, while only a handful rearmed with a 45 mm (1.77 in) gun soldiered during the summer of 1941. The next one, the T-19, was an improved version, which never came into full production. The British Vickers Mark E was replicated instead, as the T-26. 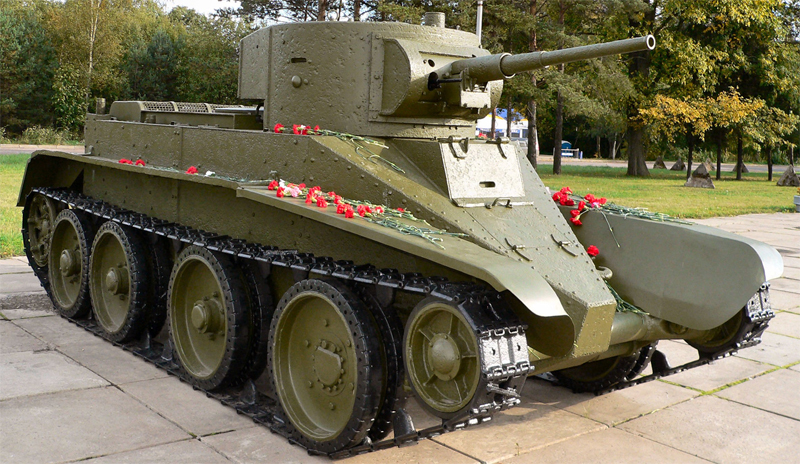 The British tank, bought in 1931, was a revelation for Soviet engineers and was immediately copied. After the initial series, armed with low velocity guns, with limited armor and relatively weak engine, the model was completely redesigned, emerging as the model 1933 T-26. This led to the biggest peacetime tank production ever, with 10,600 built and an impressive number of variants. It was widely exported and fought throughout the world, before and during the first stages of WW2. The T-24 was the first true Soviet medium tank. Only 25 were produced by the Kharkov Locomotive Factory (KhPZ) in Ukraine. Armed with a 45 mm (1.77 in) gun and three machine-guns, with one mounted in small turret on top of the main one, it was essentially an enlarged T-18 (18.5 tons), with a slightly reworked suspension. Although the project was dropped in 1931, the suspension was kept for the highly successful Komintern artillery tractor (2000 built) and Voroshilovets heavy artillery tractor (230). This project helped form a team that would prove successful later on. The T-27 tankette was greatly inspired by the Carden-Loyd Mk.VI. The local version was larger, but still light enough to fulfill typical tankette duties, such as reconnaissance and supply. “Airborne armored support” tests included tankettes and amphibious light tanks like the T-38. A few of the 2700 originally produced still served actively in the summer of 1941. The T-19 was a light tank designed in 1929 by engineer Semyon Alexandrovich Ginzburg to fulfill multiple and contradictory specifications from the RKKA (Workers and Peasants Red Army). The requirements were changed many times, even during trials, and further complicated the delivery of a suitable preseries vehicle. It had to be fully gas-proof and amphibious, fast, well armored and armed, and easy to manufacture as well. The project was eventually dropped in favor of a licence-built version of the Vickers 6-ton. Inspection of T-34s and crews, before departing for the front. With bigger industrial capabilities, huge forced manpower and a more pragmatic way to build tanks, the Red Army overwhelmed the Wehrmacht, despite their superior tanks and tactics. 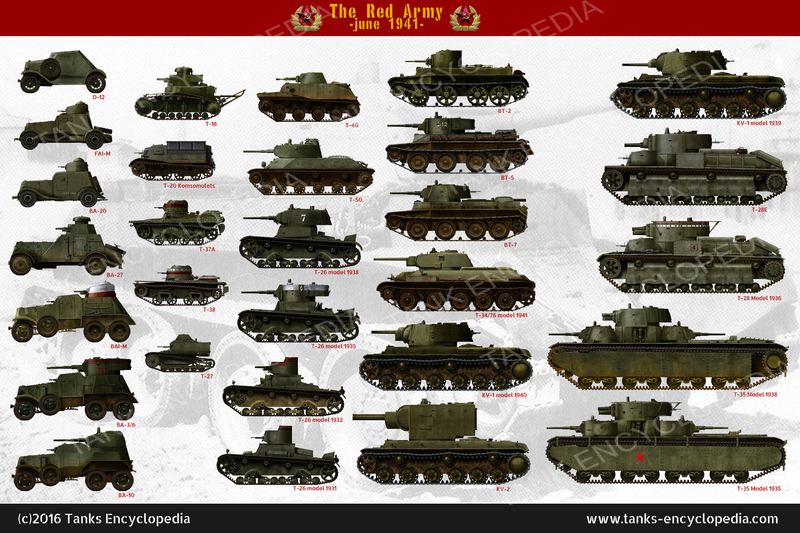 All variants of the T-16 and T-18, the first Soviet tank that entered mass-production. The T-26, the most widely produced tank of the thirties. It was the most successful derivative of the British Vickers 6-ton (Mark E). The BT-2 on trials. The BT series (Bystrokhodny Tank meaning “fast tank”) was directly based on the Walter Christie’s “race tank”. This was a convertible machine, which could travel on paved roads on its wheels only, without tracks. The Soviets bought two Christie M1931 and the license to produce them. Soon after, they derived the BT-1 prototype, BT-2 and BT-3 pre-series, and mass-produced the BT-5 and BT-7. These were the fastest tanks in service in 1939, as the BT-2 was capable of 100 km/h (62 mph). It suited the Soviet “deep battle” doctrine and around 6000 machines were produced. The T-28 was the standard medium “infantry tank”. It was typical of the late thirties, with its sluggishness, heavy armor and multiple turrets. It took a strong influence from the Vickers A1E1 Independent, and was produced from 1933 to 1941. By then, it was completely obsolete. The BT-7 cavalry tank was derived from the Christie design. It was fast, but still lacking protection and firepower, at least compared to the standards of 1941. It was then the second most common Soviet tank besides the T-26 and played an instrumental part in the victories at Khalkin-Gol against the IJA. The BT-7M was the last version of the Soviet cruiser tanks, upgraded in many ways. The biggest change came from the engine, derived from a diesel already tested on the experimental BT-8. The transmission, gearbox, tracks and drive sprockets were also changed, and in 1941 the protection was increased. For the BT series, protection and firepower were sacrificed. In 1939-40, new designs reversed this trend and, through the A-20 and A-32, created a brand new breed of “cruisers” turned into true medium tanks. These were the direct precursors of the legendary T-34. 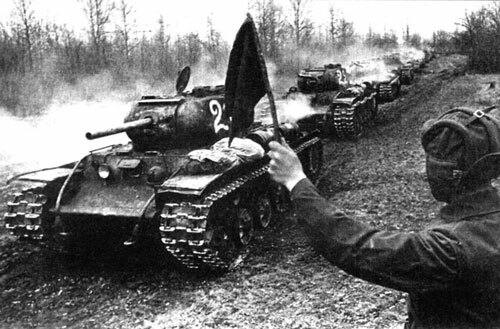 The T-34/76 was the most successful Soviet tank of the war. It came from a long series of cruiser tanks. The 1st pre-series vehicle is pictured here. In 1941, it was superior to any German design, successfully covering the very difficult “magic triangle” (protection, mobility, firepower), with the bonus of easy mass-production. 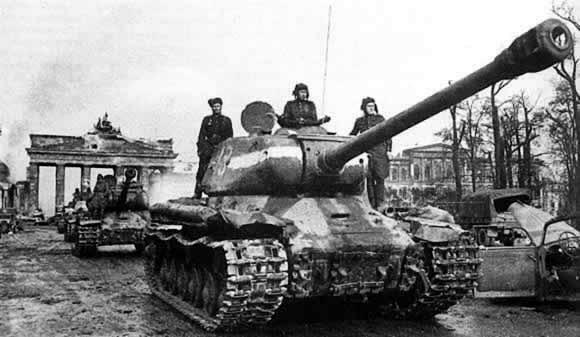 The T-34/85, a 1943 version of the legendary T-34, the most produced and widely used tank of WWII. This tank greatly contributed to the victory achieved by the Red Army. It was pivotal in all offensives, still sporting decent speed and protection, along with an upgraded armament and many mass-production improvements. The Soviet KV-1 was named after “Kliment Voroshilov”, a famous Soviet defense minister. It became as famous as the T-34 because of its strong armor. 5220 were built from 1939 to 1943. It was the mainstay of the Soviet heavy tank units until 1944. The KV-1S was a late attempt (fall 1942) to bring back some mobility to the KV-1, while sacrificing some armor and introducing a brand new, lighter cast turret. A few were built, but their development paved the way for the more ambitious KV-85. 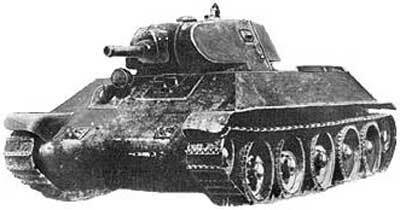 The KV-85 was a hybrid, transitional model built in small numbers. It was originally the KV-85G, which was meant to feature a modified KV-1S turret with an 85 mm (3.35 in) gun jammed inside, and would have made a horrible stopgap. 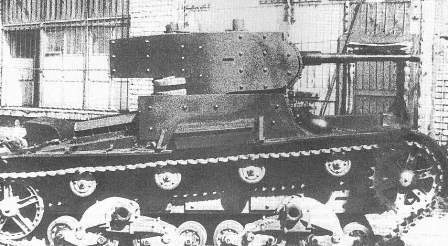 The KV-85G almost entered production, but trials of the IS-85 turret on a KV-1S chassis took place, and this trial variant was accepted into stopgap production as the KV-85. The Soviet IS-1, the true successor to the KV series (named after Joseph Stalin and sometimes written as JS-1). Armed with its 85 mm (3.35 in) gun, it was produced in small numbers, before being replaced in production by the more successful IS-2. The IS-1 lacked firepower against the Tiger, so the engineers managed to equip the largely remodelled hull and turret with a massive 122 mm (4.8 in) gun, re-designating the vehicle as the IS-2. Although reaching a new level in raw firepower, the new gun was slow to reload and it could only carry a limited number of shells. Nevertheless, it gave new confidence to the crews which could have a fighting chance against the best German tanks. The Iosif Stalin 3 was the last of the wartime heavy tanks series. It was only entering service when Berlin fell. The turret inspired later Cold War designs. The series continued on until the death of Stalin in 1953. The last was the IS-10 (T-10 after 1953), which came after the prototypes IS-6 and IS-7, and the postwar IS-4 (only 250 built). The Soviet Union not only bought Vickers tanks, but also tankettes. The world-famous Carden-Loyd model of 1926 was bought, completely rebuilt and improved as the T-27. Indigenous models like the T-17 and T-23, based on current light models, never fulfilled the requirements and remained only prototypes. The T-27 was still, at least superficially, a faithful replica of the British model. 2750 units were produced before 1933 by the Bolshevik Factory and GAZ. This lightweight machine was used in original experiments like various airborne tank trials. By 1941, they had all been removed from frontline operations, serving as gun tractors and in training units. Another British product which was held in high esteem by the Soviet government was the Vickers light amphibious tank, designed for the export market. The Commission envisioned it roaming the northern Russian wilderness and, after purchasing the license to build them, the T-37A and the T-38 were mass-produced from 1933 to 1939. They were used mainly as scouts, but some were tested for airborne operations, dropping them into lakes, being part of the “deep battle” tactical developments. Eventually, the USSR had more amphibious tanks than any other nation by the outbreak of World War Two. The T-70, certainly the most prolific light tank series at that time. 960 built – obsolete by 1941, used for training. Some 70 were up-gunned with a HV 45 mm (1.77 in) gun in 1941, and used as bunkers. 2750 built – obsolescent tankettes, still used as scouts, armed gun tractors and for training. Around 1200 built between 1933-34, mainly used in swampy areas, like the Pripet marshes. 1300 built – more recent (1937-39), some still used as scout tanks. 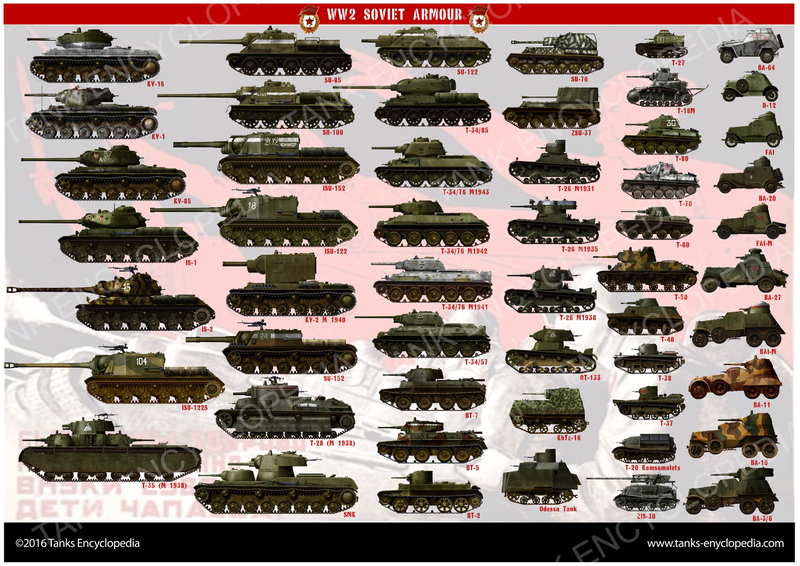 10,300 built plus 1700 variants – formed the bulk of Soviet tanks forces in 1941. Approx. 4 built – Enhanced version of the T-26. Cancelled due to high cost. 222 built – a modernized amphibious tank (1940). However, it was also the last. 69 built – a sloped-design model (1941), its cost halted production. 6292 built – a non-amphibious, successful model (1941-45). 8226 built – an evolution of the T-60, produced until 1948 and later sold to many client states. 122 built – a two-man turret evolution of the T-70. However, production was quickly cancelled. Several tank projects – the experimental “Grotte”, the short-lived T-24, the T-28, which was largely based on the T-18 suspension, and the ubiquitous T-19, a failed “jack-of-all-trades” – proved the Soviet industry not up to the task of delivering a tank worthy of western standards. The general staff once again turned westwards for inspiration. The Soviets decided to experiment with cruiser tanks, as a part of the “deep battle” tank warfare theory. Strangely, this fast tank (“Bystrokhodnyi Tank”) or “BT”, took its roots within the US ordnance, as a derivative of the Christie M1931. Designed by a talented engineer, Walter J. Christie, the M1931 was an experimental fast tank aimed to replace the cavalry. Since the US cavalry branch was forbidden by law from having tanks, it employed armored cars, but at that stage, these had mediocre off-road capabilities. Christie pioneered many areas with his “convertible tank”. It could run without tracks, making it suitable for the cavalry, which could present them as “convertible armored cars”. It was for the first time equipped with a radial aviation engine, in a time when most tanks of the time had bus, tractor or truck engines. This proved lightweight, very powerful and compact. It was the first tank featuring immense vertical (helicoidal) suspension (known as the Christie suspension) coupled with very large rubberized roadwheels, allowing for lightning-fast off-road rides. This was indeed a very impressive package in action and the press soon nicknamed it “the flying tank”. Impressed, the Russian commission bought two Christie M1931 tanks (which arrived turretless, much to the Soviets’ chagrin) and the license to manufacture them. The suspension and general design was produced under license or strongly influenced designs in many other nations, including Great Britain. The USSR fielded no less than 8000 of these in the summer of 1941. The BT itself was an inspiration for the A-20 and the A-32, prototypes with full sloped armor and fixed tracks, which led to the T-34, probably one of the most influential tank design of Word War Two. The BT-5 Series 2 of cavalry tanks. These clearly traded protection for speed, seen as an “active” form of protection in itself. 650 built – 1932-33, successful cruiser or fast tank (based on the Christie M1931). 1884 built – 1933-35, improved cruiser tank. 5556 built – 1935-41, main Soviet cruiser tank. 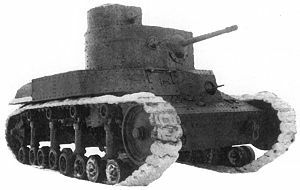 The improved BT-7M (1938) was the direct ancestor of the A-32 and the T-34. The T-34 was a “game changer” on the battlefield. It was rarely seen during the summer of 1941, since production was interrupted and entire factories were dismantled and relocated eastwards, to the foothills of the Ural mountains. Soon, the complex grew considerably and became so crammed with factory lines that it became known as “Tankograd”. Its goal was mass-production on a truly amazing scale, rivaling the US industry. Not only could this complex (and others, like at Stalingrad) provide entire armored divisions in a month, but the Stavka soon restructured the number of types to be produced. Only two contenders were chosen, the T-34 and the KV-1. The first one was everything the perfect tank could be in 1941. It was fast and powerful, with a highly reliable engine, simple to manufacture (and the base design was simplified even more during the war), had a high-velocity 76 mm (2.99 in) gun suitable against any German tank of the time. Most of all, it featured thick and well-sloped armor, which combined deflecting characteristics as well as an artificially increased protection against direct fire (with a 30 degree slope, 60 mm/2.36 in became equivalent to 90 mm/3.54 in of solid steel). This was the first tank really successful in combining firepower, speed and protection in a single package, without sacrificing any aspect. However, the Soviet choice to mass-produce this kind of tank even after the war (in the fall of 1943 it was upgunned to 85 mm/3.35 in) was quite opposite to that of the German engineers, under the strong pressure from Hitler. The Fuhrer was taken over by the so-called uber-tanks, large, over-engineered tanks which he thought could turn the tide of the battle, even facing overwhelming opposition. 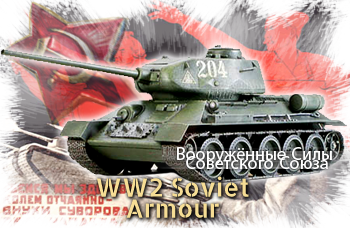 One thing is certain – the T-34 had a tremendous influence on “2nd generation” tank designs until the end of the war. 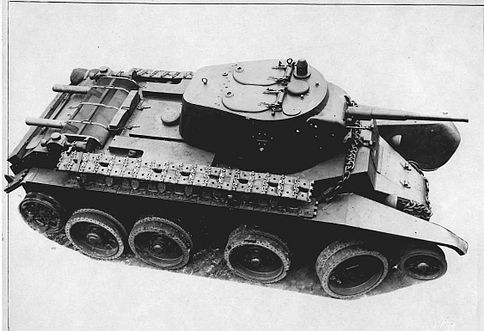 The Panzer V “Panther” was conceived as a direct response to it. 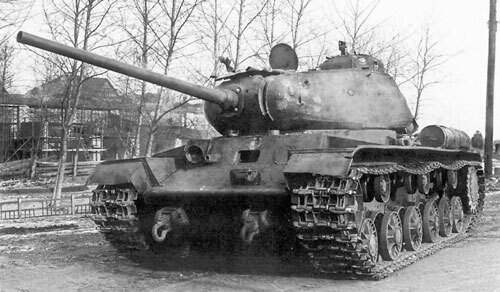 The T-44 was a short-lived attempt to create a “universal tank” (marrying aspects of the T-34 and KV-1) to ease mass production by commonality. It was a failure then, but the idea lived to be reincarnated with success after the war in the main battle tank concept. 503 built – early Soviet medium tank, multi-turetted, 1934-41. Through its tonnage and size it was more of a “medium heavy”. 1939-40, prototypes for the T-34. 35,120 built – 1940-43, main Soviet medium tank, was equipped with a 76.2 mm (3 in) gun. 48,950 built – 1943-58, up-gunned version of the latter, with ZiS-S-53 and DT-5 guns. Biggest tank production of the war when combined with the model 76. 1823 built – 1943-44, improved version and designed successor of the T-34. Heavy tank design was also influenced by the need for breakthrough tanks. These were also tributary to the “deep battle” tactical approach of armored types. However, there were few heavy tanks in existence by 1930. France had the obsolescent FCM 2C from the 1920s, while Great Britain and the USA had the Mk.VIII “Liberty”, the last of the WWI rhomboid models. In Britain, Vickers produced the A1E1 Independent, a modern design which also introduced a multi-turreted configuration. Only one tank was built, and it had a tremendous influence on the first Soviet design, the T-28. This was classed as a medium, but had all the characteristics of a breakthrough tank. It was slow and equipped with a howitzer, only suitable against concrete fortifications. The T-35, based on the T-28, appeared later as the first “true” heavy tank, still of this generation of multi-turreted models. The T-35 appeared from the same kind of personal fantasy both dictators (Hitler and Stalin) shared. This obsession with mighty invincible “land battleships” reflected the state leader’s personal grandeur, and turned into superb tools for propaganda. However, these dinosaurs were not practical war machines and the multi-turreted T-35 is a formidable example of this utter failure. The following KV and IS series were more reasonable and infinitely better, although still sacrificing mobility for protection and firepower. The Soviet SMK multi-turreted heavy tank prototype, Red Army, June 1941. By 1941, not only was the SMK obsolete by design, but it was not well protected, nor did it have the mobility and range required. Like the German Neubaufahrzeug, it was mostly useful for propaganda purposes. The SMK evolved into a single-turreted version armed this time with the F-34 anti-tank gun. Better known as the KV-1 (after the defense minister, Kliment Voroshilov), this new model was characterized by the more versatile armament and classical, straight, but almost impregnable armor. Weighing nearly 50 tons, it was the backbone of Russian heavy tank units in 1941. Modernized as the KV-1S, then KV-85, this model was soon replaced by the IS-1 (for “Iosif Stalin”) and the up-gunned IS-2 in 1944, which could deal with the latest German tanks. 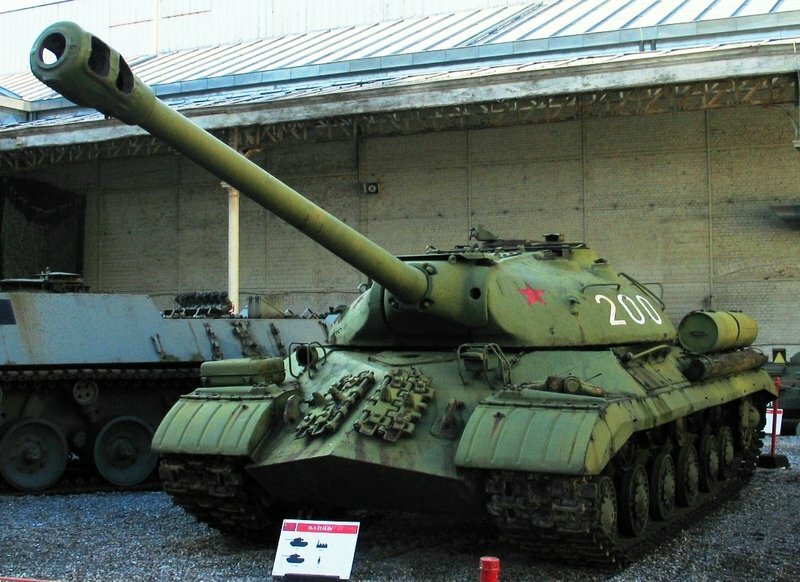 The the IS-3, entirely revised, appeared too late, but set the tone and appearance for all upcoming Soviet heavy and medium tanks to come during the Cold War. 61 built – 1934-38, Soviet main heavy tank until 1939. Served only as propaganda machines and considered unreliable by 1941. 5219 built – 1939-1943, main frontline heavy Soviet tank. 225 built – 1938-39, variant of the KV-1 equipped with a 152 mm (5.98 in) howitzer. 143 built – 1943, improved KV-1S, transitional model. 207 built – 1943-44, redesigned version of the KV-1. 3854 built – 1943-45, modernized version of the IS-1, with a much more powerful gun. 2311 built – 1944-46, evolution of the IS-2 with a completely revised hull and turret. Served after WW2. Attempts to make tank destroyers only came during the 1941 summer campaign. The first were improvised on Komsomolets tractors, but the crews operating the gun were left completely unprotected. Some very old T-18s were equipped with the modern 45 mm (1.77 in) guns, with mixed success. But the true mass-production came in 1942-43, first with assault guns like the SU-76, when it was discovered that high velocity field guns could still pack a deadly punch at short range. Moreover, they were easier to produce than regular tanks and could be delivered by second-grade factories with low-quality tooling equipment and unskilled labor. But the first true “tank killers” were also the first vehicles to use new generation guns like the 85 mm (3.35 in) and the 100 mm (3.94 in), based on the T-34 chassis. Their production was relatively moderate because by early 1944, the up-gunned T-34/85 arrived en masse to the frontline. 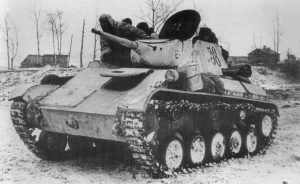 The ISU-122 was a short-lived vehicle using a heavy 122 mm (4.8 in) gun and replaced by the regular mass-produced IS-2 tank. 100 built – 1941, conversion of the T-20 Komsomolets light tractor. 75 built – 1945, light SPAAG, based on the T-60/T-70 chassis. 14,230 built – 1942-45, light SPG tank-hunter, based on the T-70 chassis. Around 2000 built – 1943-44, medium SPG tank-hunter, based on the T-34/76 chassis. 2330 built – 1944-45, medium SPG tank-hunter, based on the T-34/85 chassis. 1735 ISU-122 and 675 ISU-122S built – 1944-45, heavy SPG tank-hunter, based on the IS-1 chassis, equipped with the A19 gun. Many prototype SPGs were tested during the late thirties, most based on the T-26 chassis. The SU-5 was probably one of the first, equipped with a 76 mm (2.99 in) mortar howitzer. Some BT fast tanks were also derived into small series of support tanks, but the gun was operated from a fully revolving turret. During WW2 the bulk of the type was represented by the SU-76, which was an assault gun, but commonly used as a tank hunter. The first true SPGs came in 1943-1944 only in relatively small quantities compared to other tank models. The SU-122’s raw power with HE rounds was found quite efficient against German heavy armor, as seen at Kursk. Later, an even more potent weapon was adopted, the 152 mm (5.98 in) howitzer, also capable of jamming the turret of German tanks or penetrating the turret or hull in parabolic, indirect fire. Both models were used as improvised tank-hunters with relatively good results. Their main contribution was as infantry support against any kind of fortifications throughout the two last years of the war, as German forces retreated in a large-scale defensive war, through well-prepared defensive positions. 1150 built – 1943-44, medium SPG based on the T-34 chassis, with a 122 mm (4.8 in) howitzer. 704 built – 1943-44, heavy SPG based on the KV-1S chassis, with a 152 mm (5.98 in) howitzer. 1885 built – 1944-45, heavy SPG based on the IS-1 chassis, with a 152 mm (5.98 in) howitzer. 215 built – 1928, first mass-produced Soviet armored car. 600+ built – 1934-36, early Soviet armored car. 1424 built – 1936-39, main light Soviet early armored car. 566 built – 1933, heavy armored car. T-26 turret. 3311 built – 1938, late heavy armored car, wartime version. T-26 model 38 turret. About 20 built – 1941, last Soviet heavy armored car, production stopped because of the invasion. 9110 built – 1942, standard wartime light scout armored car, also produced postwar until 1960. 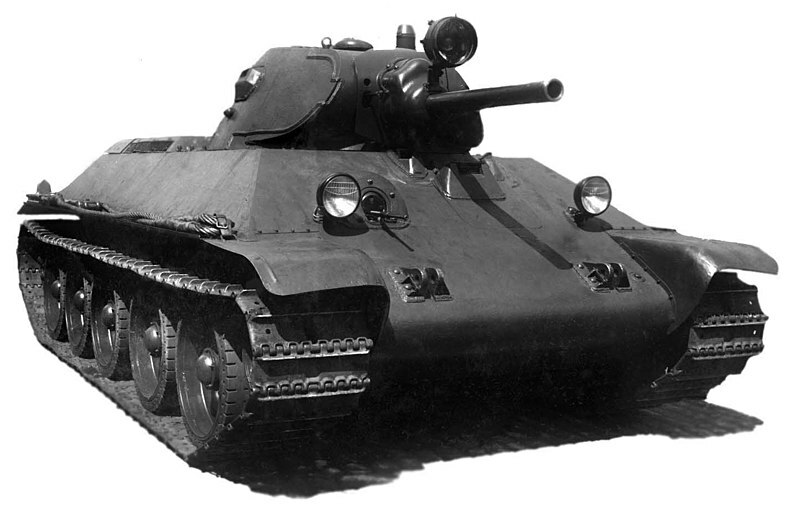 The Soviet T-35A is the only five-turreted tank in history to enter production. With a long and proud service history on Soviet parade grounds, the T-35A was forced to adapt to the modern battlefield when the Second World War broke out. Outclassed and outdated, the T-35A tried to hold its own against the German invaders to no avail. For the first time, actual battlefield photographs have been cross-referenced with maps and documents to bring about the most complete look at the T-35A in the Second World War to date. A nice brief review of russian tanks. Thanks. This site is my go-to reference for armor. Excellent site. Can you direct me to a reference for the Soviet WWII BSNP Reconnaissance Vehicle? It was a T-26 variant without a turret, but with a radio rail. Thanks. T-35 only had a machine gun and is slower than most of the armored cars so idk what the use would really be. Uhm he means the T-35b Heavy Tank which had a low velocity 76mm cannon and two 45mm low velocity turrets and a hell of a lot of machine guns. The T-35 had poor armor and slow speed. It also required 11 people to operate effectively..That’s a lot of lives to lose. The T-35A Heavy Tank was armed with three cannons and a load of machine-guns. You are probably mistaking it for the T-37A or T-38. For Billybob: No such thing as a T-35B. German tanks are more important then these tanks . germas lost a war because the russian army was bigger than german army. I am looking for details of Soviet Armoured Recovery vehicles, circa 1943. It’s a very nebulous thing, to be honest. There was no dedicated recovery vehicle until post-war. Mostly, turretless tanks were used, or tractors. Famous examples are KV-1 recovery tank and T-34 recovery tank with no turrets. Other than that, S-60 and S-65 tractors were used. 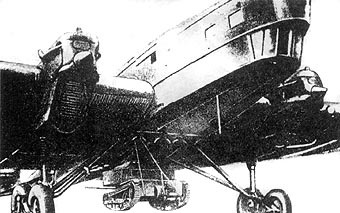 The Ya-12 was also used for towing light tanks. There was a “high speed” tractor made until 1942 called the C-2, but this was mostly used in the heavy artillery towing role. I love Soviet tanks. So pretty and destructive. I was absolutely sure, that there was an article about the soviet Tank Grote. What happened to it? There is (and never was) any article on the Tank Grotte. However, the topic is present in the T-35-1/T-35-2 page. I wanted to know if you are going to/working on the SU-57B? We will be covering the SU-57B sooner or later. However, unfortunately, it is not being worked on right now. I think IS-10 is T-10 or IS-8. I can’t remember IS-10 heavy tank. Very cool site. I’m a little confused between the IS-85 and IS-1 though. To me they look almost identical in appearance and stats. They are the same thing, just two different names for it.